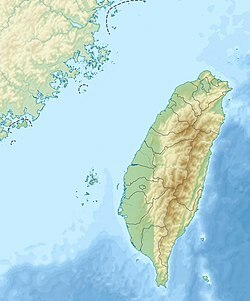 The Dapenkeng culture (Chinese: 大坌坑文化) was an early Neolithic culture that appeared in northern Taiwan between 4000 and 3000 BC and quickly spread around the coast of the island, as well as the Penghu islands to the west. Most scholars believe this culture was brought across the Taiwan Strait by the ancestors of today's Taiwanese aborigines, speaking early Austronesian languages. No ancestral culture on the mainland has been identified, but a number of shared features suggest ongoing contacts. The type site in Bali District, New Taipei City in northwest Taiwan, was discovered in 1958. Other major sites excavated before 1980 are the lowest layer of the Fengbitou Archaeological Site in Linyuan District, Kaohsiung and Bajiacun in Guiren District, Tainan, both in the southwest of the island. Dapenkeng sites have since been found in coastal areas all around the island, and on the Penghu islands in the Taiwan Strait. Pecked pebbles, up to 20 cm across, were probably used as net sinkers. Bark beater were found at two sites. Adzes were highly polished, with a rectangular cross section. Shouldered adzes made of basalt appear later in the period, and are believed to come from a workshop on Penghu. Many thin, flat, triangular points of green slate were found, each with a hole drilled through the centre. Reaping knives made from oyster shells and some tools and ornaments made from bones and antlers have also been found. The inhabitants engaged in horticulture and hunting, but were also heavily reliant on marine shells and fish. Later in the period they cultivated foxtail millet and rice. Around 2500 BC, the Dapenkeng culture developed into locally differentiated cultures throughout Taiwan. Because of the continuity with later cultures, most scholars believe that the Dapenkeng people were the ancestors of today's Taiwanese aborigines, and spoke Austronesian languages. The Keqiutou site on Haitan Island was partially destroyed by later activity, but has been excavated by Fujian archaeologists. It features worked pebbles, polished adzes and points similar to those of Dapenkeng sites. The decoration of the pottery is more varied. The Fuguodun site on Kinmen was found by a geologist, and excavated in an ad hoc manner. Some of the pottery is decorated with cord-marking, but stamping with shells is more common. The Jinguishan site on Kinmen features similar pottery to Fuguodun, but without cord-marking. K.C. Chang argued that Fuguodun and Dapenkeng were regional variants of the same culture. Other scholars consider them distinct cultures, pointing to differences in pottery styles. These coastal mainland cultures seem to have appeared abruptly without local precursors, and their origins are unclear. Chang and Ward Goodenough argue that these cultures reflect the influence of the Hemudu and Majiabang cultures of the lower Yangtze area, though they are unsure whether this was the result of migration or trade. Peter Bellwood agrees that the Austronesian cultural package came from this area, but confirming archaeological evidence has not yet been found. ^ Li (2013), p. 616. ^ a b Li (2013), p. 618. ^ Chang (1995), p. 166. ^ Chang (1995), pp. 166–167. ^ Li (2013), pp. 617–618. ^ Hung & Carson (2014), pp. 13–14. ^ Li (2013), p. 619. ^ Li (2013), p. 615. ^ Hung (2004), p. 58. ^ Chang (1995), pp. 164–165. ^ a b c Jiao (2007), p. 93. ^ Jiao (2007), pp. 45–54. ^ Chang (1995), pp. 169–170. ^ Jiao (2007), pp. 54–56. ^ Chang & Goodenough (1996), p. 41. ^ Jiao (2007), pp. 56–57. ^ Jiao (2007), p. 57. ^ Chang & Goodenough (1996), p. 47. ^ Jiao (2007), pp. 57–58. Chang, Kwang-Chih (1989), B. Gordon (ed. ), translated by W. Tsao, "The Neolithic Taiwan Strait" (PDF), Kaogu, 6: 541–550, 569. ——— (1995), "Taiwan Strait archaeology and Proto-Austronesian", in Li, Paul Jen-kuei; Tsang, Cheng-hwa; Huang, Ying-kuei; Ho, Dah-an; Tseng, Chin-yu (eds. ), Austronesian Studies Relating to Taiwan, Taibei: Academia Sinica, pp. 161–184. Chang, Kwang-Chih; Goodenough, Ward H. (1996), "Archaeology of Southeastern coastal China and its bearing on the Austronesian homeland" (PDF), Transactions of the American Philosophical Society, New Series, 86 (5): 36–56, JSTOR 1006620. Hung, Hsiao-chun (2004), "A sourcing study of Taiwan stone adzes" (PDF), Bulletin of the Indo-Pacific Prehistory Association, 2: 57–70. Hung, Hsiao-chun; Carson, Mike T. (2014), "Foragers, fishers and farmers: origins of the Taiwanese Neolithic", Antiquity, 88 (342): 1115–1131. Li, Kuang-ti (2013), "First farmers and their adaptation in coastal Taiwan", in Underhill, Anne P. (ed. ), A Companion to Chinese Archaeology, John Wiley & Sons, pp. 612–633, ISBN 978-1-4443-3529-3.